Trem-spaced version of our original high output ceramic humbucker, the Duncan Distortion Trembucker is perfectly suited for aggressive players. 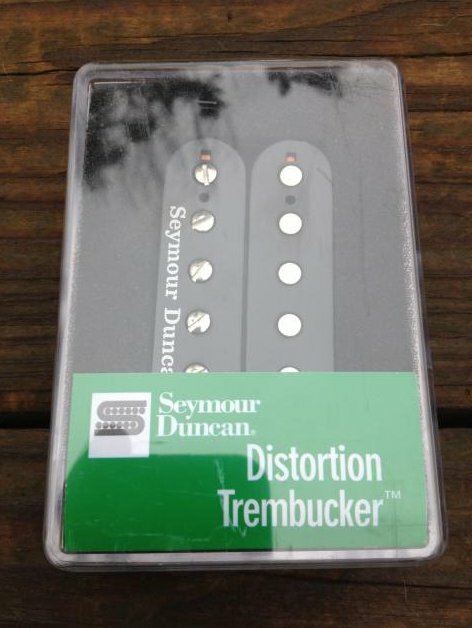 The Duncan Distortion Trembucker is the F-spaced version of our original high output humbucker. It incorporates a massive ceramic magnet and hot coil windings to deliver well-balanced rock and metal tones that have rih upper midrange harmonic content. Great for hard hitting, crunchy rhythms, and searing lead tone. Pair it with the SH-6n Distortion neck pickup, or with the SH-2n Jazz, or SH-1n 59 model for a versatile combo. Pair with the Jazz neck model for a versatile humbucker setup, or use the Duncan Distortion neck model for the a killer high output setup.Trembuckers have wider pole piece spacing, perfect for symmetrical positioning under the strings of guitars with a tremolo or wide spaced hard tail bridge (2 or wider from the center of the Low E to High E directly over the bridge pickup). Hand built in our Santa Barbara, CA factory, the Duncan Distortion Trembucker uses a large ceramic bar magnet, nickel silver bottom plate, 4-conductor lead wire for multiple wiring options, and is vacuum wax potted for squeal-free performance.